Morgan Dollar Price Guide Illustrates Past and Present Value Trends. The Morgan Silver Dollar is today one of the most popular collector coins. 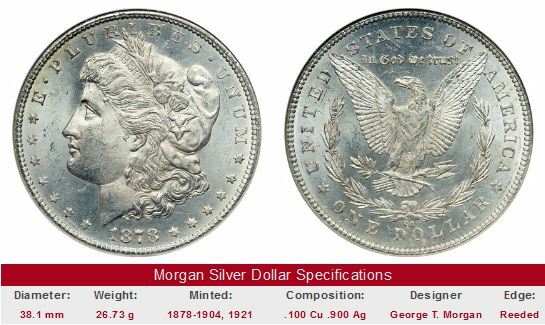 First minted in 1878 following the passage of the Bland-Allison Act, the new dollar was named after its designer, US Mint Engraver George T. Morgan. For the benefit of serious numismatists, US Coin Values Advisor has published a Morgan Dollar price guide in tabular format, reporting price trends over a long period of time for individual coins of the series, across a wide range of grades. Throughout much of the 19th century, silver mining companies were amongst the nation’s most powerful interests and provided the impetus behind Bland-Allison. Under the new law, the Treasury Department was required to purchase $2 million to $4 million worth of silver every month and mint it into dollar coins, in the quest to stabilize the price of silver at superficially high levels. This plan led to quantities of silver dollars so large that they far exceeded the demand, resulting in millions of unused dollars piling up in bank and Treasury vaults. Few, if any, coins have ever been released under more questionable arrangements than Morgan Silver Dollars (keep reading here). The Bland-Allison Act was modified by the Sherman Silver Purchase Act of 1890. The Sherman Act mandated an increase in government silver purchases to $4.5 million in silver monthly, to be paid for with Treasury bonds redeemable in either gold or silver. Unexpectedly, most bond holders redeemed their notes in gold, depleting the Treasury’s gold reserve and throwing the entire country into a severe financial panic in 1893, leading to the repeal of the Sherman Act, which greatly slowed the production of silver dollars throughout the remainder of the 1890’s. Coinage of the silver dollar was suspended after 1904 when the bullion supply allotted for the dollar pieces was exhausted. The above image, "Out of the Silver Flood", appeared on the cover of Puck magazine on Sept 13, 1893. 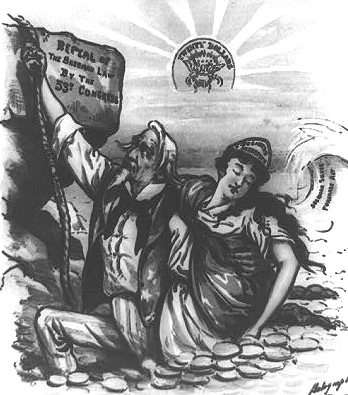 Uncle Sam is pulling a woman, representative of business interests, out of a flood of silver dollars unleashed by the Sherman Silver Purchase Act. Uncle Sam is relying on a rope called "Public Opinion", to carry him over a rock designated as "Repeal of the Sherman Law by the 53rd Congress." Because the Sherman Act was blamed in part for the financial crises of 1893, Congress heard from many angry constituents demanding its repeal. In the background is a gold double eagle symbolizing the sun, meant to express the promise of brighter days under the gold standard. The Sherman Silver Purchase Act was repealed on November 2, 1893. Under the guidelines of the Pittman Act of 1918, over 270 million silver dollars were melted down for export and/or re-coinage into smaller denominations. Some of the silver derived from the Pittman Act was used in the production of the 1921 dollars, the final year of the Morgan series. More melting occurred following the Silver Act of 1942. Further meltdowns of many Morgan dollars took place again in the 1960’s and again in the late 1970’s as a result of rapidly rising silver prices. The big meltdowns explain why some Morgan dollars with reported mintages of over a million pieces are so scarce. It is estimated that only about 17% of the total number of Morgan Silver Dollars produced survive to this day. After the last of the Morgan Dollars exited the coin presses, most collectors showed disdain for them. Many banks were stuck with Morgans and were happy to trade them off at face value, regardless of condition. This scenario changed noticeably in 1962, when the US government announced they would sell original Treasury bags of 1000 silver dollars to anyone with $1000 to spend. News bulletins of rare dollar discoveries hit the media outlets, igniting a wave of interest in Morgan Silver Dollars. The 1903-O, which up this point was considered very rare in Uncirculated grade, was unburied in large quantities in pristine condition. The sudden surge in the supply of mint state 1903-O examples dropped the value of the coin from $500 to $35.00 within a few months. The Treasury sale resulted in most of the government owned Morgans moving into the private sector, widening the circle of collectors in a way no one could have predicted. The Morgan Silver Dollar collector base expanded again in the early 1970's, when the General Services Administration individually packaged many of the remaining Morgans in federal possession and sold them to the public in a highly advertised event. The fact that so many of the dates offered were from the fabled Carson City Mint heightened the element of intrigue. Today, collectors are willing to pay a premium for Morgan Silver Dollars still housed in their original "GSA" holders. Collectors with numismatic ambitions plus a desire to own coins destined to increase considerably in the years ahead will find plenty of opportunities for doing so with Morgan Silver Dollars. As always, coins that have shown the strongest gains in the past over a period of decades are the coins most likely to produce similar results in the long term future. Not surprisingly, these are all considered key date Morgan Silver Dollars, rare coins which collectors have battled over for generations. Yet, there were other Morgans that came in close behind and have withered the test of time similarly. If we were to do another study in a couple of years, it might be their turn to go to the head of the class. The other legitimate Morgan Dollar key dates are the 1878-CC, 1879-CC, 1880-CC, 1881-CC, 1882-CC, 1883-CC, 1884-CC, 1885-CC, 1890-CC, 1891-CC, 1893-CC, 1893-O, 1895, 1895-S, and the 1903-O. In case you haven't noticed, every dollar from the Carson City Mint made the key date list. This is because the lore of the Old West, something many collectors crave, has combined with scarce supply to create sustained value increases for the Carson City dollars over a very long time period. Morgan Silver Dollars are perhaps the most visible group in all of American numismatics, and have been for a long time. Trying to cash in on the Morgan craze, promoters of dubious character overhype the coin, even common date material, as a top notch investment. Buyers taken in by all the hoopla are disappointed if they were expecting stratospheric returns on their money. Worse yet, a favored technique of the fly-by-night crowd is to push an overgraded coin onto a trusting buyer. When the buyer tries to sell, they are disgusted to learn their "MS-65" coin is really an MS-63 by numismatic standards. The safest policy to guard yourself against this rip-off is to purchase only examples that have been graded by PCGS, NGC, ICG, or ANACS, or at least are being sold by a reputable dealer. The left hand side of each "Sales Box" is value trend data over a very long period of time for the date headlined, in F-12 condition. The percent annual increase is computed for comparative purposes.The coin pictured for sale in the right side, if any, is not necessarily an example in F-12 condition.